Online Registration is now closed. You can still register for the race at Run With It-170 Miracle Strip Parkway SE, Downtown FWB. Packet pick up will be Friday from 4-6pm and Saturday from 6:30 to 7:45 at the race start. Fast and flat out and back course through beautiful downtown Ft. Walton Beach. Great awards ceremony and afterparty at the coolest place on "The Strip", KC's Sandbar-the only beach in the city. 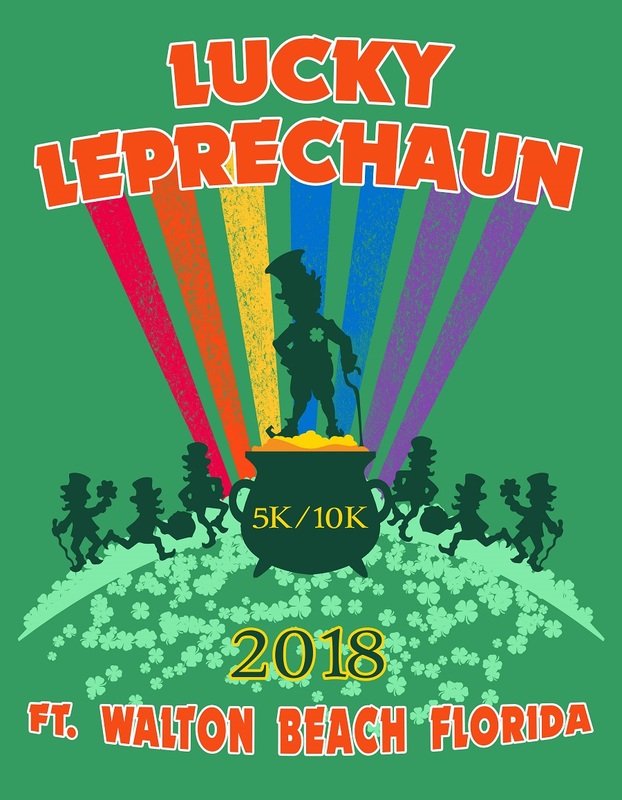 Kick off your St. Patty's Day week with a fun race and huge after party with food, brew and live music! Awards for Runners: Overall Male and Female, Master and Grandmaster. Male and Female 3 deep in 5 year age groups. Awards for Walkers: Top 3 Overall Male and Female. Participate in our raffle drawings with some great prizes to be won for just a $1 a ticket. Proceeds will go to The Northwest Florida Track Club Fund to build a rubberized track in Okaloosa County. Womens T-shirts are available and run small. St. Patty's Day costumes are encouraged. Packet Pick up will be at Run With It 170 Miracle Strip Pky SE Ft. Walton Beach, FL 32548 on Friday, March 16, from 4pm to 6:00pm and Saturday morning from 6:30am-7:15am at The Landing. There is a 90 minute time limit for 10K walkers which will be strictly inforced. Online registration closes Thursday, March 15 at midnight. You may still sign up in person at either packet pick up. This is a rain or shine event. Sorry, no refunds for any reason.